FC Barcelona coach, Ernesto Valverde, claims that Brazilian starlet Arthur is set to return from his hamstring injury and could feature in the upcoming clashes against Real Madrid. Arthur has proven to be a vital piece in the puzzle for Valverde's Barcelona in his first season with the club. The 22-year-old Brazilian has earned comparisons with Xavi courtesy his playing style and received enormous praise due to the impact he has had in the midfield. The Brazilian's caliber was portrayed in this season's first Clasico where Barcelona managed to inflict a crushing 5-1 defeat on their arch-rivals. The club announced that Arthur had suffered a hamstring strain earlier this month, which is why he was set to miss out on the clashes against Los Blancos. 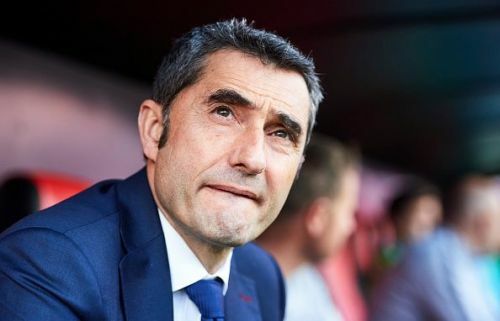 But Valverde has now explained that the Brazilian midfielder is a lot better and can feature against Real Madrid in the coming days. "He's a lot better," Valverde told reporters in a news conference as quoted by AS. "He did some training yesterday. "I don't know how he dealt with it - we'll analyse that in today's session. I wasn't really planning for him to be back for this game. "We'd like to have him back for Saturday. There's a chance he'll be ready [for Wednesday]. He's a different kind of player. He brings something different to our midfield. Real Madrid will host Barcelona twice in the coming days and Valverde will be hoping that Arthur does indeed prove his fitness prior to the mouthwatering clashes.